roughly 1 to 1.5 miles outside the CBM fields. Although little change in the water levels of the monitored coalbeds in Montana has been observed since 2004, the areal extent of water drawdown in the coalbeds is predicted to increase in the future as CBM production increases (see also Chapter 1). Meredith et al. (2008) predicted the 20-foot drawdown contour to expand to 4 miles beyond the edges of the large production fields. Results from these studies apply specifically to drawdown in the Dietz and Canyon coalbeds, which are uniquely identifiable and distinguishable coal- and methane-bearing aquifers; however, as noted above and in Chapter 2, these coalbeds, while regionally pervasive, are not necessarily the same as shallow alluvial coalbed aquifers that may supply substantial domestic and livestock water or contribute to significant base flow of perennial water resources in this area. Groundwater models and monitoring results have been interpreted to indicate that water levels in the Anderson-Dietz and Canyon coals will take decades to return to original levels (Wheaton and Meredith, 2009). The extent of water level drawdown in the coalbeds and the time to recovery depend on (1) proximity to CBM production, (2) site-specific aquifer characteristics, (3) proximity to recharge areas, and, potentially also, (4) connection or access in the coalbeds to water from deeper horizons (Meredith et al., 2008). On the edge of the basin, near recharge areas, 75 percent recovery occurred within five years of the monitoring period when pumping was discontinued in the Anderson coal formation. In the center of the area monitored, where pumping was most aggressive, groundwater levels in the Anderson coal have recovered 65 percent in 10 years (Wheaton and Meredith, 2009). An example of groundwater drawdown and recovery in several wells in the Anderson-Dietz coal aquifer in Montana is shown in Figure 5.1. Sufficient data have not been collected at this point to either (1) characterize the contributing sources to recharge or (2) determine through geochemistry comparisons whether the recharge water is the same as or uniquely different from water currently within the coalbeds. In the latter case, recharge could be attributed to redistribution of water due to pressure (or head) gradients resulting from several years of pumping. In the Wyoming portion of the Powder River Basin, the Wyoming State Geological Survey, in collaboration with BLM, analyzed data from 111 wells in the BLM deep-well monitoring network, collected from 1993 to 2006 (Clarey, 2009). The data indicate that drawdown occurs within the coalbeds or coal aquifers ("confined coals") and that the magnitude of drawdown is greater nearer to monitoring wells located in areas of CBM development than in areas peripheral to development, consistent with that reported by Meredith et al. (2008). The measured impacts include a maximum groundwater-level drawdown of up to 625 feet within the coals in Fort Union coal monitoring wells and maximum groundwater-level drawdowns of more than 260 feet in the overlying Wasatch sandstone. 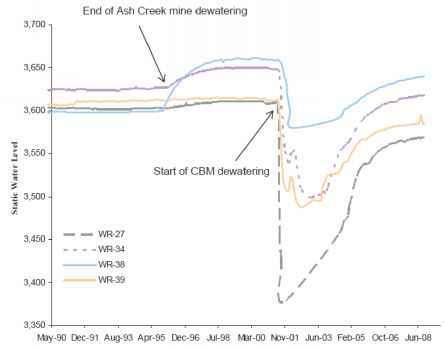 FIGURE 5.1 Measured groundwater elevations in Anderson-Dietz coal seams during and after coal mining dewatering and then following the initiation of CBM-related dewatering. The larger drawdown (80 to 233 feet, starting in 2001 ) is related to CBM production, and recoveries of 73 to 87 percent over a seven-year period are related to a gradual decrease in CBM production. Full recovery is predicted to take 20 to 30 years. These wells are located in the CX CBM field in the southwestern corner of the Montana portion of the Powder River Basin near the Wyoming border. The original drawdown (pre-1 995) in Figure 5.1 was from coal mine dewatering, and water levels largely recovered before CBM production began. 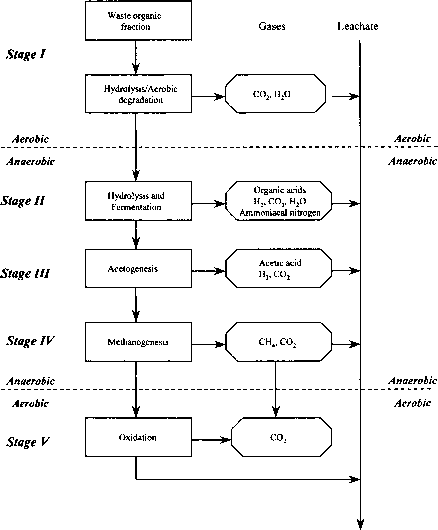 SOURCE: Meredith et al. (2008). Since 1997, hydrological impacts in the Powder River Basin from CBM development have been regionally confined to some of the Tongue River Member coals of the Fort Union Formation and some of the sandstone beds in the overlying Wasatch Formation. The latter sandstones are deeper beds that are in physical contact with the coalbeds. Importantly, these drawdowns are being measured in coals that are the same as the coals being pumped for methane extraction.